The aim of this study was to utilise IHC and quantitative digital image analysis techniques to evaluate expression of PD-L1, MHC-1, Acetyl Histone H3 and Acetyl-α-Tubulin within the viable tumour region of mouse syngeneic cell line derived xenograft tumour tissue samples. The team at Propath were asked to first define and optimise the parameters for IHC staining. The parameters for each biomarker were optimised on positive control mouse FFPE tissue known to express the antigen of interest. The choice of antibodies and positive control material was identified by performing a thorough literature review, followed by discussion and agreement with the sponsor. Method development followed SOPs developed at Propath over many years, including: full antibody titration, antigen retrieval assessment, additional blocking, signal amplification and optimal detection chemistry. An assessment of precision, specificity, linearity and reproducibility was also performed to confirm a robust IHC method. The outcome was a set of validated protocols for some notoriously difficult biomarkers, which could then be used confidently on the Sponsor’s tumour study samples. The optimal IHC assays were then applied to mouse tumour samples supplied by the Sponsor. The stained sections were scanned using Propath’s Hamamatsu digital whole slide scanner. Analysis algorithms were developed to initially detect and classify the viable tumour region of interest (ROI) per section per marker. Positive IHC staining was then quantified as the number of positive cells, nuclei or area within the viable tumour ROI. A further evaluation of IHC stain intensity (H-score) was generated per marker within the viable tumour ROI. The study report included all IHC method development and validation protocols, final optimum working conditions and main study staining data. For the digital image analysis phase, the report included details of the algorithm development, quantitative data read out, results and discussion. As an additional part of this study, a section of each mouse tumour underwent haematoxylin and eosin staining for subsequent assessment by an experienced pathologist of necrosis, apoptosis, mitosis and immune cell infiltration. Scientists at Propath were asked to develop and optimise a dual IHC stain for immune cell markers FoxP3 and CD4 in human tonsil tissue, that could subsequently be used on human samples from a clinical trial. Multiplex stains are technically complex where multiple parameters require balancing to produce a clear, precise and intense stain for the two or more test articles. Robust IHC methods were developed and optimised for FoxP3 and CD4 in positive control tissue. Following this the two methods were combined to form a dual IHC stain. Multiple factors were controlled and balanced, including antigen retreival conditions and detection chemistry. The initial dual stain did not show optimal staining for CD4 when combined with FoxP3. Following a logical and stepwise development approach, the team at Propath employed an alternative alkaline phosphatase detection method. This greatly enhanced the CD4 signal whilst maintaining the FoxP3 DAB staining. The team successfully developed a multiplex stain for FoxP3 and CD4 with specific membranous staining for both markers and clear visualisation of areas of co-localisation. The method was then applied to human samples within a GCP clinical trial. The objective of this GLP tissue cross reactivity (TCR) study was to assess the potential cross reactivity of a novel antibody-drug conjugate in a panel of frozen human tissues and blood smears from three unrelated donors. 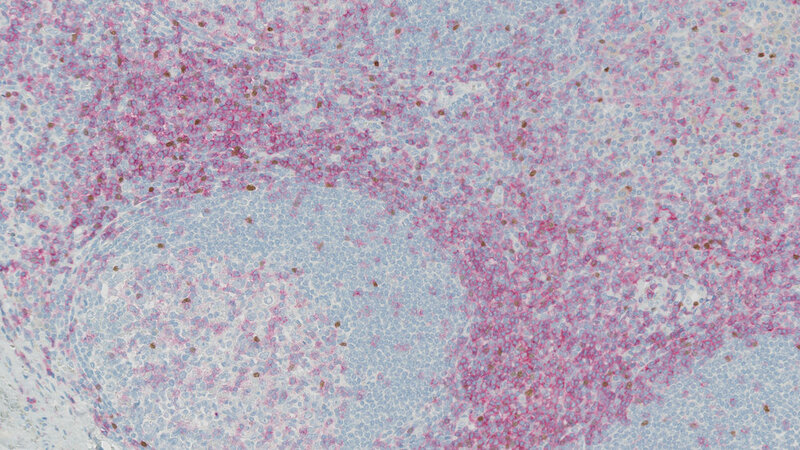 Propath adopted a two-phase approach to this study: a non-GLP method development and validation phase to produce a robust, reliable immunohisto-chemical (IHC) method; followed by GLP staining and pathology review of the stained tissue panel. Minimal pre-existing IHC data was available for the test article, and so full and extensive method development was performed including testing parameters for antibody titration, antigen retrieval, blocking, amplification and detection reagents. This was followed by an assessment of specificity, linearity, reproducibility and a background staining assessment on a limited panel from a single donor. For this particular study the optimised IHC assay used a HRP-based detection strategy with a semi-automated method (manual application of the test article and isotype control). During this phase the fully optimised and validated IHC method was run on the tissue panel. A panel of 38 different frozen human organs (including blood smears) with at least three donors per organ was evaluated. This 38-tissue panel satisfies both FDA and EMA recommendation for regulatory submission. Three different concentrations of the test article (30, 3 and 0.3μg/mL) were assessed and the isotype was used at the highest concentration of 30μg/mL. Sections of frozen human breast tumour tissue were included in each staining run as a positive control tissue along with a known negative control and buffer replacement control. A crucial element of the GLP TCR phase is the quality of the tissues in the panel being tested. To ensure reliable and useable study results, it is essential to use frozen tissues of the highest possible quality to maintain optimal antigenicity with no areas of necrosis or autolysis that may impact on staining and subsequent assessment. To demonstrate that the tissues used met these quality criteria, the team performed an assessment of tissue integrity for each tissue specimen. This involved staining a section from each donor with a dual IHC stain for Cytokeratin and Vimentin, which demonstrated antigenicity for all tissue architecture. TCR test tissue slides were reviewed and scored by an experienced board certified pathologist and a full study report including all validation protocols, tissue donor information, pathology review, tissue cross reactivity findings and representative images was provided to the sponsor. Screening of a novel CD25 antibody construct across multiple donors and multiple tumours on a single slide using a TMA. Specific staining with optimal signal to noise ratio was achieved allowing subsequent pathologist analysis of the multi-donor, multi- tumour TMA. The objective of the study was to investigate IHC staining outcomes of a novel antibody construct for a CD25 target across multiple tumour tissues in anticipation of using the test article in a subsequent clinical study. Prior to running a test article in clinical samples, it is beneficial to perform a staining assessment in a tissue micro array (TMA), as this mimics the variety in fixation and tissue processing likely to be seen in clinical samples from multiple sites. A single IHC method was developed and validated in positive control tissue using the automated Roche Ventana Discovery Ultra IHC platform. Method development and validation involves testing all IHC parameters and an assessment of precision, specificity and reproducibility. Once the IHC method was validated on control tissue, scientists at Propath then transferred this to TMA slides. With their many cores from multiple donors, each of which may have been fixed and processed using different protocols, developing a robust protocol for TMA staining can be particularly challenging. In addition, in this study, the TMA comprised a range of tissue from healthy to diseased states. Given these nuances, it is important to test any IHC method prior to running the final test TMA slide. The team at Propath found that the range of fixation and processing influenced staining intensity, and so adjustments to several IHC parameters were required. To overcome variations in fixation, a slightly longer, harsher retrieval was used along with a mild block to help reduce background staining often seen in tumour samples. To demonstrate specific antibody staining an isotype control was run alongside the test slide. The team successfully developed a robust IHC method for TMA samples showing specific membranous and cytoplasmic staining with subsequent H score analysis by a board-certified pathologist. The objective of this study was to quantitatively assess localisation and co-localisation of macrophage subpopulations M1 (CD68) and M2 (CD163) on single tissue sections. Individual IHC methods were developed and validated on the Ventana Discovery Ultra platform for both CD68 and CD163, which were then reviewed and signed off by an experienced board-certified pathologist. The two single IHC staining protocols were combined into a dual multiplex stain, which demonstrate intense, specific staining for both biomarkers and enabled clear visualisation of areas of co-localisation. Test samples were then analysed by Oracle Bio using Definiens image analysis software, considered one of the most advanced analysis platforms available. Algorithms to identify positive staining for each sub-population, co-localisation of sub-populations, and negative cells were developed using the single and dual IHC control slides. Dual IHC stained control tissue – human tonsi. It can take considerable time and experience to develop and validate classifiers to ensure that all positive cells are identified and distinguished from negative cells and background artefacts. Parameters including colour and hue, shape and size were optimised for each biomarker and specific tissues of interest. Once a successful algorithm had been validated on control slides, regions of interest were highlighted on the test tissue slides by a pathologist and in agreement with the sponsor. The algorithms were then applied to the test samples. Data output included M1 positive index, M2 positive index and the ratio of M1:M2 per region of interest. The sponsor was provided with a comprehensive study report that comprised details of the IHC method development and validation phase, pathologist review including representative images, quantitative analysis algorithm, and a statistical analysis of the study data.